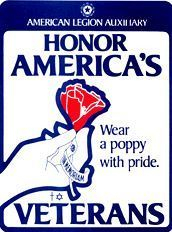 The American Legion Auxiliary remains the world's largest women's patriotic service organization. Our non-profit group is comprised of mothers, wives, daughters, sisters, granddaughters, grandmothers and great-grandmothers of servicemen and servicewomen eligible for American Legion membership. Together, we work hand-in-hand to enhance the lives of veterans, active durty personnel and military families here or abroad. We're advocates who interact with government, educate the general public, mentor youth and promote broad causes of patriotism, good citizenship, peace and security. Write to find out more! American Legion Auxiliary Girls State is a non-partisan program that educates young women to responsible citizenship, the inner-workings of government and love of country. Since 1937, nearly one million girls have attended through full Auxiliary sponsorships.